So it’s the start of another week. Already it’s busy with a number of visits to constituents set up to see first hand the issues they are looking to resolve. On top of that there is a full week of meetings on important local issues both at Walsall Council and at the West Midlands Combined Authority. Today (Monday 10 Sept 2018) it’s the Health and Wellbeing Board at Walsall Council House, 6.00 pm. There’s a heavy agenda covering Transforming Care Plans for adults, children and young people with Learning Difficulties and/or Autism across the Black Country. The report provides an update on progress and the local issues for Walsall. This is followed by a debate on progress of the Walsall Children and Young People Mental Health and Wellbeing Strategy and Transformation Plan,along with a progress report on Walsall’s Health and Wellbeing Strategy where we will be being asked to agree to a proposal on the added value partner organisations can bring to issues within the the Strategy document on things such as homelessness and rough sleepers and how important air quality and sustainable travel are to the health and wellbeing of us all. On the issues surrounding air quality and sustainable travel, tomorrow’s Economy and Environment Scrutiny Committee has this on it’s agenda and as the chair I have invited members of the Health and Wellbeing Board along to take part in that debate. Other items on tomorrow’s agenda will include a presentation from the West Midlands Combined Authority showing the links between a number of its key strategies and the work being done at a local level. These strategies include the Strategic Economic Plan, the Black Country Local Enterprise Partnership and the Housing and Land Remediation Strategies. The Economy and Environment Scrutiny Committee will also be setting up a Work Group to look into the Private Rented Sector and Selective Licensing. This is a second look at the subject which created a stir within the sector. It will be interesting to see how this develops. 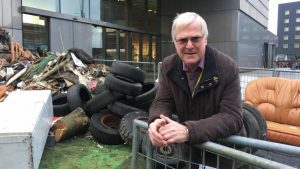 Also tomorrow I will be involved in a West Midlands Combined Authority Work Group looking into the issues facing the region’s housing and land needs, how these could be met by helping to remediate the many “Brown Field” sites across the region in particular around Walsall and the Black Country. it will also touch on the question of what is actually “Green Belt”. On Wednesday there is another West Midlands Combined Authority Work Group I’ll be involved in, this time to look into the workings of the Combined Authority. It’s been running for just over a year now in it’s current form since the Metro Mayor election of 2017 so it will be good to look at what works well and seek to improve that which doesn’t work so well.